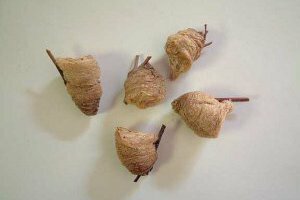 These packages are entirely self contained, all one needs to do is hang the package on a nail or twig in the garden. Opening the package is unnecssary. The egg cases may contain between 200 and 400 eggs with an average of about 300. Upon hatching in the spring the young may crawl out between tiny flaps in the case and hang like silken threads about two inches below the case. After the young dry out they disperse into the vegetation, leaving little or any evidence of their hatching. This happens within an hour or two and it is very difficult to know if the egg has hatched unless the well camouflaged, elusive young can be found.